There really is no reason for a tourist to know about Ambelokipi. There are no archaeological sites there. Not really any important museums except maybe the National Gallery (if it is open). It is not a particularly interesting area for shopping, (in fact the only store I know is Jeanaration on Sinopis Street and only because my friend Tony owns it). But there are several hotels in and around Ambelokipi, and since I lived there and still go there to visit friends or to eat, well why not share my knowledge of an area that is anything but touristic, with the few tourists who end up staying there. Anyway, like every Athens neighborhood, Ambelokipi has its hidden charms and when you get down to it, this is not a bad area to stay. First of all, the reason you are staying in Ambelokipi most likely is because it is cheap. Maybe you found your hotel, most likely The President, on Booking.com because it was a 4-star hotel that cost about the same as a 2-star. Or you booked a Greece package with too-good-to-be-true prices and this is the hotel they gave you. Lots of people who come with groups end up here because the travel companies either don't know Athens or they don't care where the hotel is as long as it is cheap. Or maybe you went to your local travel agent in Omaha, Nebraska or Tiblisi, Georgia and they, knowing not much more than you do about Athens, booked it. Well the good news is that even though there are many good hotels in bad areas the Hotel President is not one of them. I don't mean it is a bad hotel in a bad area. Actually I don't know or care if it is good or bad because I have never stayed there. What I mean is that Ambelokipi is not a bad area. Unlike many of the hotels that have very cheap rates because they are in seedy and even dangerous areas, Ambelokipi is not a seedy area nor is it dangerous. 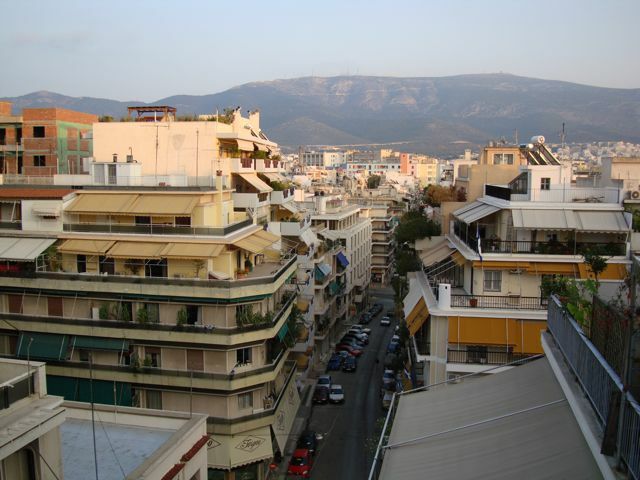 It is a mixed area of middle class Greeks, students and immigrants, mostly Philippino and Albanians who have jobs and own their apartments. It is a real Athenian neighborhood. Before I continue let me add that as far as tourists go it is not only the frugal and the uninformed or misinformed who end up staying in hotels in and around Ambelokipi. There are several very nice hotels in the area including some hotel-apartments around the American embassy about which I will tell you more about at the end of the article. Ambelokipi has a couple things going for it if you are a tourist or even in Athens on business. 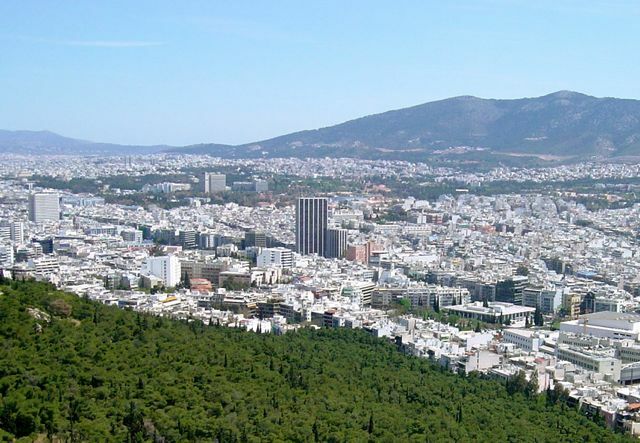 First of all there are three metro stops in the area, all on the line that goes to the airport, Syntagma Square and Monastiraki, where you can connect to Pireaus. There are also several trolley buses that go downtown as well as just about every bus that comes from the leafy northern suburbs like Marousi, Kifissia, and Agia Paraskevis. Alexandras Ave, Kifissias Avenue, Mesoghion Avenue and Vassilios Konstantinos all intersect at Ambelokipi and through these roads you can get just about anywhere on this side of the city. There are not many notable buildings in the area. Most of them were bulldozed in the sixties and seventies and replaced with four and five story concrete apartment buildings. There used to be a castle at the corner of Mesoghion and Vassilias Konstantinos and they demolished it to build an ugly office building(photo). OK it is not that ugly unless you know that it replaced a castle. Ambelokipi is a sea of concrete apartment buildings and it is hard to believe that half a century there were houses with gardens and unpaved roads and there were even herds of sheep munching on grass in empty lots. In 1963 I lived across from a farm on Micras Asias Street. The farmer had a horse and carriage and would deliver ice to the houses and to the newly built apartment dwellers like us. In those days very few people had refrigerators. We had ice-boxes. Nobody had TVs. There was only one channel anyway. Then developers swept in and offered people apartments for their land. Let's say you had a small house in Goudi and two children. The developers would take your land and build a five story apartment building and in return you would get three apartments. One for you and one for each child. Almost everyone took the deal. That is why Ambelokipi and much of Athens looks the way it does. The few remaining single family houses are the ones belonging to those who did not take the deal. Many of them became bars because there were no upstairs neighbors to annoy. Probably the most notable buildings are the US Embassy on Vas. 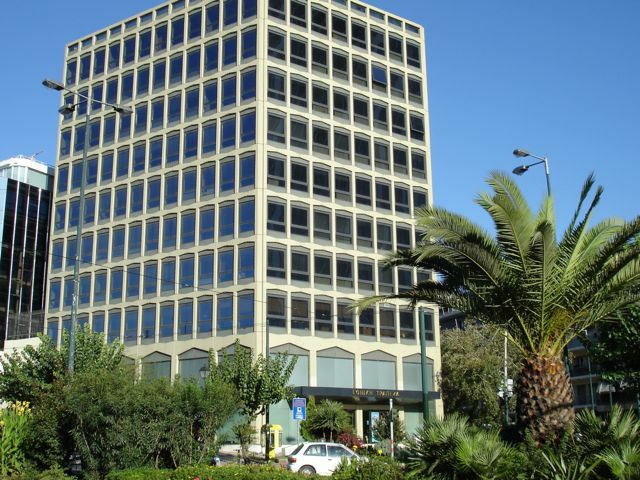 Konstantinos, which was designed by Constantinos Apostolou Doxiadis, probably Greece's most famous architect and the father of Ekistics, the science of human settlements, and the Athens Tower(photo), the first modern skyscraper in the city and one of the few buildings that is higher than six stories. I believe it is 26 floors. It was completed in the early seventies and it was by far the tallest building in Greece though there were two others built about the same time which rivaled it but were never completed. In Pireaus a skyscraper on the waterfront was found to be flawed in design. The architect killed himself but the unfinished building lives on, encased in plexiglass and plastic in order to look like an actual building instead of an embarrassment. The other building stood a few blocks away from the Tower, on Mesoghion Ave and this stood as an empty shell for twenty years until it was finally demolished and replaced with a shopping mall/hospital, an odd combination for anywhere but Athens. Another notable building and major landmark is the Athens Hilton which covers one of the largest pieces of real estate in the city and was the tallest building in Athens before they built The Tower. With a giant wall of glass and rooms facing the Acropolis, the Hilton has always rivaled the Grand Bretagne as THE place to stay and of the two was favored by Americans coming on holiday or for business. Like the GB the Hilton has a well deserved James Bond atmosphere though the it's personality is modern like the cars and devices 007 used in the late sixties, while the GB is more like Bogart in Casablanca. With several restaurants and bars, including one on the roof, and the largest and best hotel swimming pool in Athens, the Hilton, besides being an iconic if not historic landmark, is still one of the best places to stay in Athens. On two sides of the Hilton are two important things to see for those who love art. On one side is the National Gallery, and in the small square in front of the Hilton is the Glass Man, a giant sculpture made of panes of glass, that was moved here from Omonia Square. Behind the Hilton is another important historical spot that is worth a visit, the Red Lion Pub. The first English pub in Athens, it opened in the sixties. 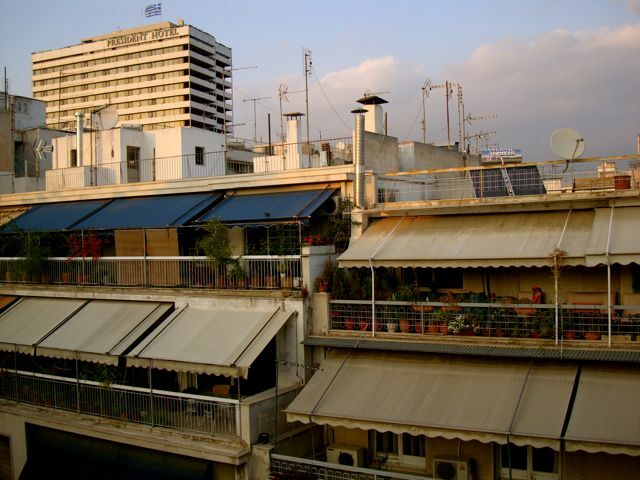 It is on Michalacopoulou Street which weaves its way among the apartment buildings of Ambelokipi like a river. That's because it is the Illissos River which in the early sixties was imprisoned underground in concrete pipes and covered up with asphalt. The Megaron Music Hall opened in 1991 and is a state-of-the-art performance center, the realization of a dream by the late Christos Lambrakis, which has brought to Athens some of the most distinguished musicians and speakers including the Berlin Philharmonic, Orchestre National de France, Pietro Mascagni, Keith Jarrett, Jose van Dam, Issac Stern, Bolshoi Ballet, and Al Gore. Yes. That Al Gore. Right next door is Eleftherias Park which took about twenty years to build. But if it is a park you are looking for, Goudi Park, at the end of Papadiamantopolou Street, is just part of an extensive outdoor area of running and walking paths, basketball courts, soccer fields, artificial lakes and open space, one of the largest in Athens, on the site of an old military base. It is also the location of the Badminton Theater(photo), which as you may have gathered from the name has nothing to do with the quality of mittens, but is the former Olympic Badminton stadium which has been converted into a concert hall, one of the best places in Greece to see live music and theater. (I saw the Broadway Musical Westside Story here, complete with projected subtitles for non-English speakers). One of the most important stops for the biggest touring artistic productions. 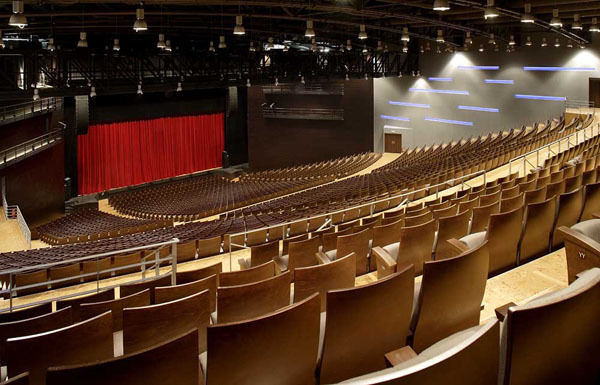 Badminton Theater has presented 800 productions and 2.500 artists that have been viewed by one million viewers. The company that runs the theater, ADaM productions (Arts Dance and Music Productions) was founded by Michael and Vanessa Adam whose first endeavor was the production of �Caf� Aman Amerika�, a collection of Greek-American songs, dated between 1910 and 1950, which were adapted and performed by Cafe Aman America Orchestra, a Greek-American band created by Mr. Adam, and one of my favorite albums. Alexandras Ave has a few notable buildings. There is an historic hospital by the small park at the intersection with Vas Konstantinos which adjoins the Flemming Center and a School for the Blind though most people really won't find this very interesting. The Panathiniakos Football stadium is supposed to be demolished for a park since it has become too small for the team which now calls the Olympic Stadium home, which is good because it keeps hooligan fans away from the shops and small businesses that line Alexandras. Further down is the headquarters of the police, which every fan of Inspector Haritos is familiar with. Beyond that are the refugee apartments from 1922 which they can't decide whether to bulldoze or turn into a national monument. If you walk about half an hour down Alexandras you will eventually come to Pedion Areos, the large park that used to be the military parade grounds, Patission Street, and the National Archaeological Museum. One of the nicest areas of Ambelokipi is the park at Ag. Thomas in Goudi. 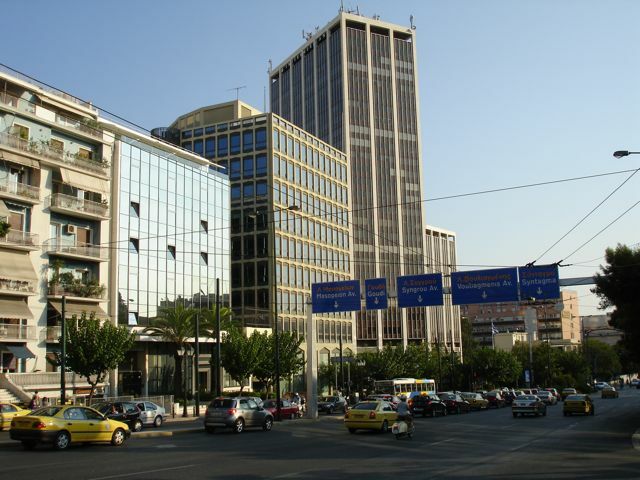 Just walk down Sinopis Street at the Athens Tower and carefully cross Michalacopoulou and walk two more blocks to Mikras Asias Street and make a left. The park is two blocks up. There are various cafes, ouzeries and restaurants that have tables and chairs beneath the trees. The best places to eat are behind the big church by the original small stone church. The park is the center of activity for the neighborhood as it has been since I lived there in 1964 and my father took this photo during the Easter celebration. There are fast food restaurants by the hospital and if you walk down that street there is a very popular Cretan seafood restaurant called Kriti at Ag Thoma 18. Well it was popular before the crisis. Hopefully it is still there. You will be happy to know that going all the way downtown for a Greek taverna experience is totally unnecessary. 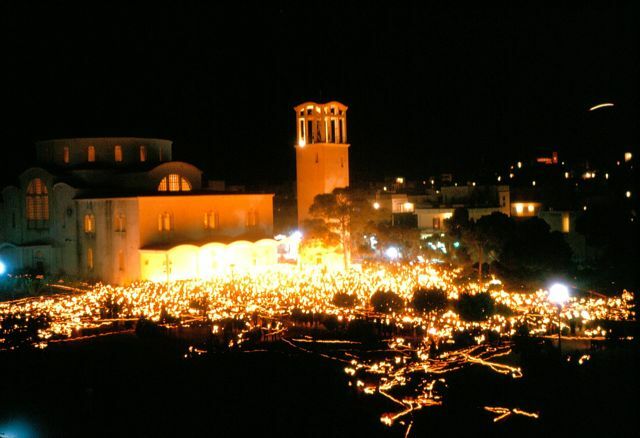 Walk up Leoforos Kifissias to the first big intersection and turn left on Panormou and you will come to a small square in a neighborhood with several Greek tavernas as well as a pizza restaurant and some other eating places. Try the basement taverna called To Koutouki 54 which is on the corner of Panormou and Evritanias streets which has been open since 1954 and will hopefully still be open when you come. For great American style steaks, a tremendous wine list, burgers, schnitzels, pizza, pasta, mezedes, fresh fish, salads and deserts in a forest setting in outdoor weather or western saloon in the winter, go to Saloon Piano Restaurant at 36 Alkmanos Street in Ilissia. It's a favorite hangout of poets, actors, artists, and journalists and has been open since the early eighties. To find it walk up Alkmanos Street from Michalakopoulou Street directly behind the Crown Plaza Hotel. 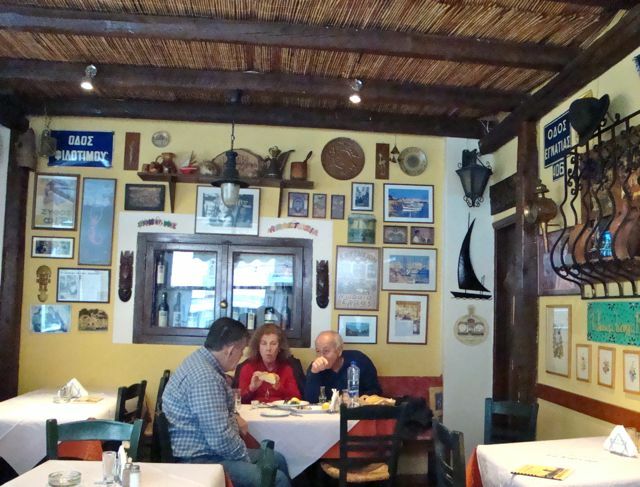 Also nearby are the famous old tavernas Ta Skalakia at 32 D. Eginitou street and Vlassis at Maiandrou 15. All three of these popular restaurants are within walking distance of each other, the Hilton, and the Megaron metro station. The first choice in the area and probably where you are staying if you are reading this, is the 5 Star Luxury Athens Hilton, which is just on the edge of Ambelokipi, in Ilissia. 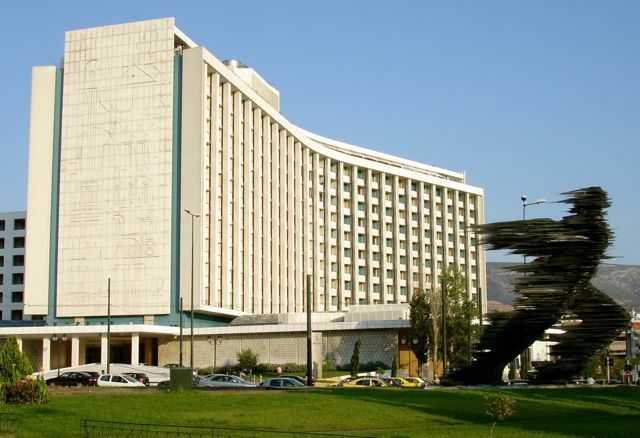 One of the world's great hotels, at least when it was built, the Hilton is an iconic landmark to all Athenians, and most if not all rooms have a view of the Acropolis. It also has the best pool in Athens and a couple great restaurants and bars. Just behind it is the 5-star Divani Caravelle which if you saw the movie For The Love of Benji, you will probably want to stay here to relive the adventures of that wonderful little dog who charmed Athens. In between are the Delice Apartments for those who need more than one room, and need a kitchen. 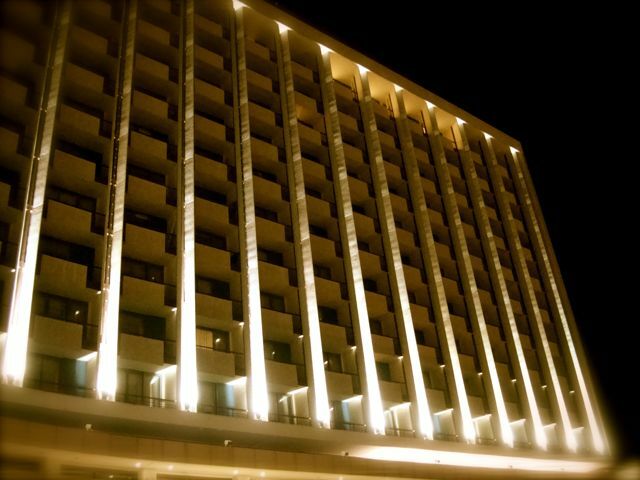 A couple blocks away, the 5-star Crown Plaza Athens City Center is a former Holiday Inn that has been upgraded. 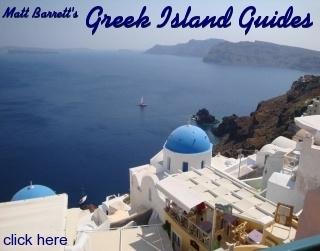 The description says within walking distance of all the historical sites, though you need to be a good walker and you are better off taking the metro or a taxi from any of these hotels, which are the closest to downtown, maybe a 25 minute walk from Syntagma and the Plaka. The 5-star Holiday Suites is a boutique hotel, owned by the Crown Plaza so you are allowed to use the amenities of both hotels. The 4-star Golden Age Hotel has free internet, has two restaurants and has an American-style breakfast. For those who only like to stay at Best Westerns, there is the 4-star Best Western Illisia Hotel. The Airotel Stratos Vassilikos Hotel has free internet, a gym, sauna-hammam and free wi-fi and like the other hotels in the area, soundproof glass. Nearby are both the Art Suites Athens and the Airotel Alexandros, both 4-star boutique style hotels. The President Hotel offers comfortable accommodation and a beautiful rooftop terrace with a seasonal swimming pool in one of the tallest buildings in Athens. It is within easy walking distance of the Panormou and Ambelokipi metro stops. There is a rooftop bar with a nice view of Athens and another bar in the lobby that has live jazz some nights.But wi-fi is 4 euros an hour and those euros can add up in a hurry. Finally on the edge of this area on Alexandras Ave, halfway between Leoforos Kifissias and Patission, in fact the only hotel that actually is within walking distance of the National Archaeological Museum is the 4-star Hotel Zafolia, which has a pool and free wi-fi. Elly's Family House is a classical Athenian single family house (not an apartment building. A real house!) with a small terrace garden, in a quiet neighborhood just a few blocks away from the Athens Hilton, Megaron Music Hall, and the metro.